If I told you that you had to follow the same straight and narrow path through life, would that worry you? I know I couldn’t be so rigid – what would happen to spontaneity, serendipity and synchronicity? We had to navigate a looong and winding road to parenthood, through infertility, IVF and adoption – the journey was certainly rocky, and straightforward would have been soooo much easier. Still I appreciate the lessons, growth and opportunities I’ve gained from life’s twists and bends, and yes, even the bumps. When it comes to our yoga practice, yoga twists and lateral bends are fantastic for getting you to be more open and flexible — and what happens on the mat can carry over to your life. Here are some reasons I love side bending and twisting so much. While it’s great to stand tall with excellent posture, by stretching the spine on the diagonal in a twisting or side-bending manner, the spaces between the vertebrae that are often compressed by poor posture are opened up and hydrated further. The small but deep multifidus muscle/fascia that wrap the outside of the spine are especially strengthened in the spiralling action, helping with spinal stability. When we twist through the waist, there is a compressing effect on the organs of the abdominal cavity – stomach, liver, intestines, gallbladder and spleen. Blood supply is effectively cut off to the digestive system and when you release from the twist, toxins are pushed out from the cells as fresh blood flows in. It’s like wringing out your body like a dirty sponge. With toxins flushed out and fresh blood and oxygen flowing into your digestive system your body is able to process nutrients in your food much more efficiently. Whenever you open up spaces between the vertebrae, you have the corresponding effect of opening up the chest and increasing the capacity of the respiratory system. In lateral bends in particular, you open up the rib cage on the long side, allowing for deeper breathing. The trick whether twisting or side bending is to lift up and out of your waist, ensuring your shoulders soften back and down rather than rounding forward. So essentially, you take excellent posture into your bend or twist and stop dumping your torso weight down into your hips. While we always use breath to take us in and out of yoga postures, in twists and lateral bends, along with forward bends, there is a real opportunity to appreciate the breath/movement connection. You can find the length and strength of the posture with your inhale breath, and feel the depth of compression and release at the base of the exhale. When you twist to either side (as we always do because we want to be balanced! ), you effectively get a 360-degree view of your life. You can think of twisting to look back as the chance to examine your past, and then when you turn to face the front again you can move forward with the perspective of lessons learned. I love that you can bend and twist in standing positions, seated and lying down – so twists and bends really are for everyone. 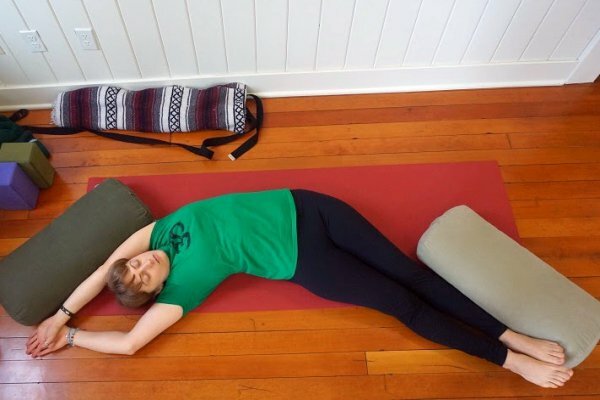 The yin restorative posture Bananasana (or half moon) - a great stretch for the IT band (that often tight band of ligament/fascia running down the side of the leg from the hip to the shin). I like to think this posture is turning your body into a smiling shape. It is also great for opening up the shoulder and underarm on the stretched side. I love feeling my spine lengthen in this seated posture and I enjoy the twist for the neck, whether in the same direction as the torso or in a counter direction. Adding an arm binding action, if this is available to you, will intensify the juicy squeeze into the abdomen. I find this to be a really relaxing twist to end a yoga session and enjoy the massaging effect into the lower back and the stretch over the hip. Do you always incorporate yoga twists in your asana practice? Which ones always make it to your yoga routine? Share 'em with us below!